You've got a new post-work hangout, Salcedo! (SPOT.ph) With a restaurant named after truffle, there's no question that the folks behind DIY pasta bar Trufa love the aromatic and earthy mushroom. It's the star of their signature Trufa pasta sauce, and it even makes an appearance in many of their other dishes, too. So it doesn't really come as a surprise that they've added the mushroom to their new Cocas or Spanish "pizza," which is exclusive to their new Salcedo branch. 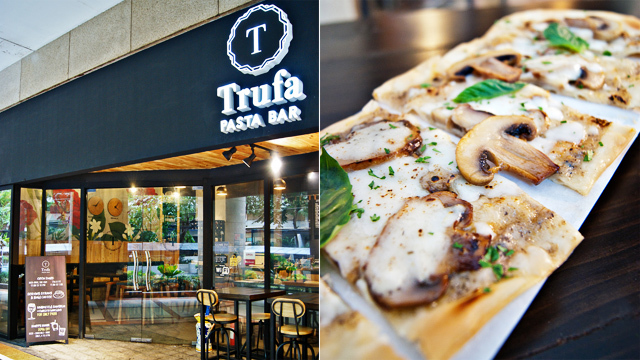 Trufa's new Salcedo branch is a laid-back after-work hangout. Trufa was inspired by owner Tricia Espina's favorite city, Barcelona, and the new branch reflects this—regulars at their flagship in Legazpi Village would be familiar with the two clocks, one set for Manila's timezone and another for Barcelona's. The homage to the city continues with their Cocas. A type of flatbread popular in Spain, the coca is lighter and thinner than their Italian counterpart, making it the perfect bite to go with your drink. 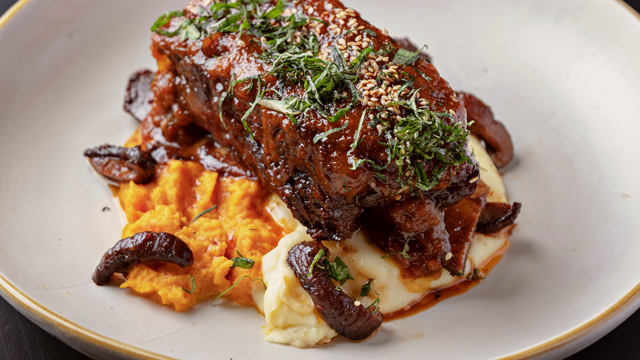 "It's very light, and it's very nice to have it while drinking wine or sangria," shares Espina. 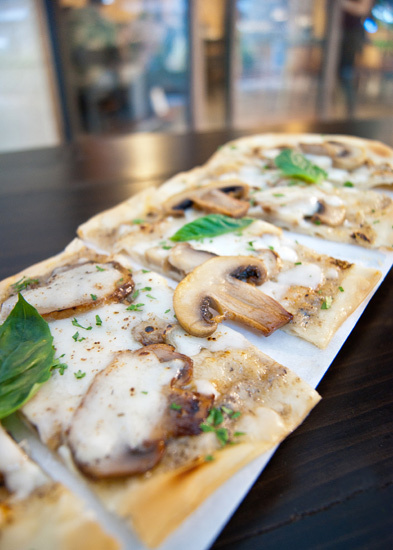 De Trufa is a creamy flatbread with mushrooms, cheese, and a rich truffle-cream sauce. De Carne is spicier with Ilonggo chorizo bits. Two versions of the Cocas are available: There's the De Trufa (P265), sure to be a runaway favorite with a distinctive earthy flavor that lets you know they didn't skimp on the truffle—cheese and mushrooms just make each crisp bite richer and creamier. 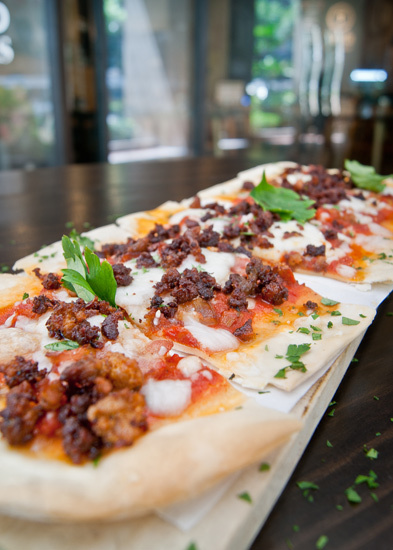 Then there's the De Carne (P225), which tastes like a pasta bolognese in flatbread form with tomatoes, cheese, and crisp Ilonggo chorizo bits. Though chockfull of flavor, these pizzas are unbelievably easy to scarf down, especially with a glass of red in hand. 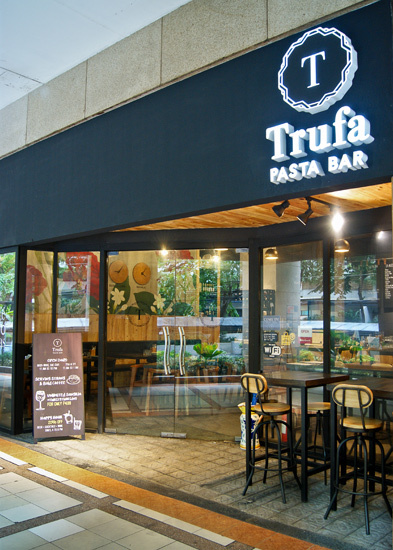 The Cocas are exclusive to Trufa Pasta Bar, G/F Paseo Parkview Suites Tower, 142 Valero corner Sedeno Street, Salcedo Village, Makati City.